Knee osteotomy is a surgical procedure for localized and moderate femoro-tibial arthrosis in active patients. This intervention makes it possible to correct the axis of the lower limb by orienting the supports towards the healthy zone of the knee. Osteoarthritis of the knee is the cartilage wear present between the femur and the tibia. The morphology of the lower limb is often the main cause. 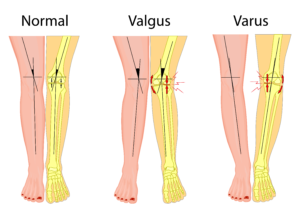 On a form called Varum, the entire weight of the body passes through this inner part of the knee resulting in premature wear of the cartilage and meniscus. It is the same for the knees said in Valgum where all the weight of the body is concentrated on the outer part of the knee. These stresses internally or externally will cause pain in the knee as well as stiffening and difficulty walking. The beneficial effect of the osteotomy of the knee is on average ten years, repelling the installation of a prosthesis. The principle of the osteotomy is to remove a bone wedge in closure osteotomy and add one in the case of opening osteotomy to allow the re-alignment of the patient’s leg.